The Lower Devonian Rhynie chert is known not only for the well preserved early land plants but also for the abundance of fungi preserved therein . By presenting a few examples selected from a larger number, this contribution is meant to draw attention to the variety of phenomena brought about by fungus activity. Some phenomena are caused by a fungus species well known and described in the palaeobotany literature [1,2]. An example is seen in Fig.1 where cells with dark fills representing so-called arbuscules of the fungus Glomites rhyniensis are seen loosely arranged in two nearly circular lines. The formation of arbuscules by several recent species of Glomus is a widespread phenomenon known as arbuscular mycorrhiza, which is important in modern plant life and agriculture. Fig.1: "Burglars' mask", cross-section of forking Aglaophyton at a position between the separation sites of xylem strand and shoot, with several features indicating fungus activity. Obviously, the cut plane shown in Fig.1 is positioned above the forking site of the central strand but below the forking site of the shoot so that two separate strands are seen but no separate prongs of the shoot. 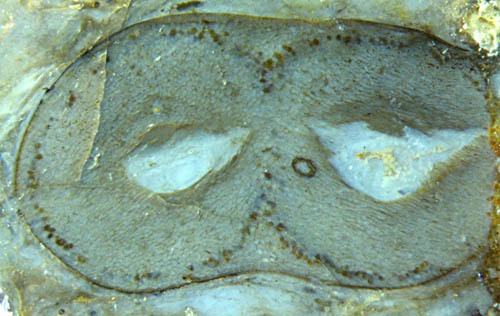 The cells with dark fill are a common sight on circular cross-sections, where they form a circle keeping at a small distance from the epidermis. Here they are tending to form two circles as if anticipating the impending separation of the shoot into prongs. This raises the question what governs the position of the fungus-affected cells. Obviously their position is determined by a more complex rule than simply by an equal distance from the epidermis as one could suspect from the usual aspect of circular sections. Hence, there is a problem whose solution might contribute to a better understanding of this particular type of symbiosis. The most conspicuous feature in Fig.1, the big voids immediately beneath the (deformed) central strands, are interpreted here as a growth anomaly caused by a fungus. There is no straightforward evidence for this but comparison with more uncommon voids and related argumentation may be convincing. (See Rhynie Chert News 4, 21, 54.) Voids formed by mere decay would most probably not be positioned symmetrically. The observations strongly suggest that one or more fungus species had affected the live plant. Another feature indicating the presence of a fungus is a chlamydospore, which is a common but not yet thoroughly understood fungus formation, seen on the right half. More chlamydospores are seen in Figs.2-5 below. They are similar to but differ from Palaeomyces Gordoni . Figs.2,3,4: "Tadpole race" in Aglaophyton: Fungus chlamydospores of uncommon aspect due to attached "tails" which are the remains of empty vesicles. Note also the line of small dots marking the presence of Glomites and a few very thin hyphae aligned lengthwise in Figs.2,4 below. While the fungus "body" consists of a dainty system of hyphae hardly visible here, the chlamydospores or resting spores seen here look like strong-walled spheres, often with the remains of same-size objects attached (Figs.4,5). The latter feature is less common in the Rhynie chert. Usually the chlamydospores are attached to a thin hypha which is seldom seen on arbitrarily positioned cut faces. (See here). In this sample the chlamydospores had been or are still attached to an enigmatic vesicle, apparently by a short thick tube (Fig.5), seen in various stages of decay (Figs.2-4). (See Addendum below, also Rhynie Chert News 64 Fig.9.) Such feature is not clearly seen in the detailed early work on Rhynie chert fungi . Fig.5: "Spectacle", fungus chlamydospore connected to an enigmatic vesicle. Detail of Fig.3, width 1mm. Fungus hyphae like those faintly seen as very thin dark lines in Figs.3,4 are usually quite abundant in the Rhynie chert but rare in other cherts. If coated with one or more layers of chalcedony or quartz they may appear as conspicuous networks, even as free-standing ones in cavities. In Fig.6 the hypha is hardly seen as a tiny brown dot in the "eye", nevertheless it has turned the random assembly of cracks and whithish precipitate into a kind of chimera. As a funny coincidence, the tiny hypha coated with clear chalcedony appearing dark under incident light had aroused the curiosity leading to closer inspection which drew the attention to some dots in front of the chimera, which had been the discovery of the oldest rotifer ever seen. (See Rhynie Chert News 23.) Hence one can say that without the coated hypha the Devonian rotifer would probably not have been found up to now and would not be found for some time to come. Fig.6: "Chimera" in Rhynie chert, composed of cracks, whitish precipitate, and a fungus hypha with thick coating of clear chalcedony appearing as a dark eye. Finally it can be stated that the Rhynie chert is exceptional also for its preservation of fungi, which justifies the expectation that more details will be found and put together into a consistent reconstruction of the complex web of early plant and fungus life involving symbiosis and degradation of organic matter. What is called chlamydospores in Figs.2-5 has been thoroughly described in  as "acaulosporoid glomeromycotan spores" forming "spore-saccule complexes". The spore is thought to develop sideways on the tail of a saccule. This means that the visual impressions from Fig.5 above and Fig.9 in Rhynie Chert News 64 , which suggest a straight connection by a thick tube, should be regarded as an illusion due to a particular line of vision. Apparently the deeper question why a big spore develops from an equally big saccule on a thin hypha is dealt with in the ample fungus literature referred to in . T.N. Taylor, J.M. Osborn: The imporance of fungi in shaping the paleoecosystem. Rev. Palaeobot. Palyn. 90(1996), 249-262. T.N. Taylor, E.L.Taylor, M. Krings: Paleobotany, Elsevier 2009. Trans. Roy. Soc. Edinburgh 52 (1921), 855-902.